Prepare for the assault on "Grand Theft Auto IV"
Will Hillary Clinton use the much-anticipated release to win over the concerned parents demo? 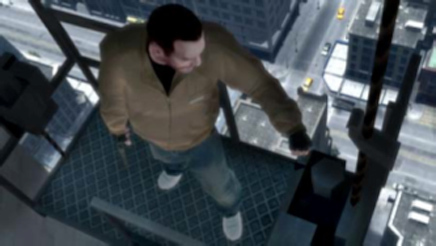 A couple months ago I had a chance to see a pre-release version of Rockstar's "Grand Theft Auto IV," the much-anticipated sequel to the controversial video game series, which will finally hit stores next Tuesday. What I saw was mesmerizing. I won't review the game for now -- I didn't get a chance to play it, just to watch a Rockstar rep play it -- but suffice it to say "GTA IV" pushes the limits of what legions of fans love about the series: the endless interactive worlds, the clever send-ups of urban life, the R-rated violence and debauchery, the teeming, chaotic, beautiful simulation of an actual city. It goes without saying, too, that "GTA IV" will spark controversy -- hell, it's already doing that, and considering the tight election, don't be surprised to hear the game mentioned by some of the highest politicians in the land. Indeed it seems only a matter of time before Hillary Clinton, who's been known to hate on "GTA," hits the emergency Scare Parents button in an effort to goose her support. The fantastic blog GamePolitics.com is a good place to track "GTA" flare-ups during the coming weeks. The site reports that already the Parents Television Council, a group that promotes clean entertainment, is calling for retailers to refuse to stock the game. In Chicago, meanwhile, transportation officials have agreed to remove "GTA" ads from busses after a local Fox affiliate criticized them. As Ars Technica notes, "we're looking forward to see if they're replaced for ads for an R-rated movie." When I watched the game, I caught one sequence that would seem sure to prompt outrage -- your character gets falling-down drunk and can, if he wants, steal and then drive a car. The scene is undeniably fun and funny. Admittedly, the humor is low-brow, more in the tradition of "Jackass" than of Oscar Wilde, but it's still fun; like much else in the game, it's the thrill of discovery, the sense of, "Whoa, I can't believe I can do that!" Of course, that'll be exactly the sentiment of the game's detractors: Can you believe they're letting children do that?! This has to be illegal! Well, actually, nobody is letting kids play this game. It's rated M, which means it's for sale to people 17 or older. Kids will still get it, of course, just like they also get hold of R-rated movies and all kinds of perversities on the Web. But nobody -- at least nobody sane -- calls for movie houses to refuse to play R-rated movies just because kids might sneak in. It's hard to see why the policy should be any different with video games.